Measurements of Pollution in the Troposphere (MOPITT) on NASA’s Terra satellite is being used to prove a concept in which new geostationary satellites could improve how agencies monitor and forecast air quality. 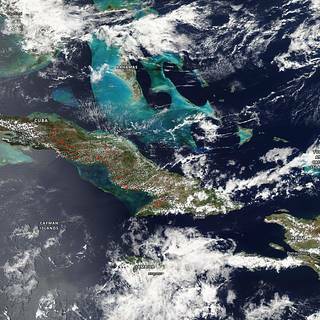 Chemistry-climate model output would be combined from satellite data from a fleet of geostationary satellites. 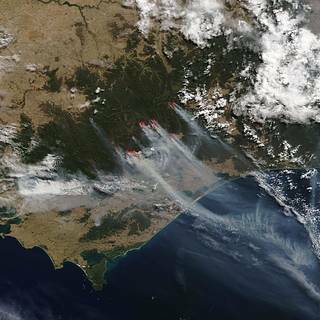 “We think the new perspective made possible by geostationary sensors would provide data that is useful for everyday air quality forecasting, as well as for early warnings about extreme events, like the effects of wildfires,” said Helen Worden, NCAR scientist and member of the research team, according to the UCAR website. MOPITT provides one to two measurements over a given location per day. The geostationary fleet would allow multiple measurements of certain locations per day, making it possible to track emissions over rush hour versus lower traffic times in some urban areas. The statistical technique used to test the geostationary fleet as a proof of concept was first developed to analyze data from MOPITT, which pioneered the measurement of carbon monoxide from space. NASA Earth Observatory images by Joshua Stevens and Adam Voiland, using MODIS data from LANCE/EOSDIS Rapid Response and Landsat data from the U.S. Geological Survey. Torrential rains in late October 2015 resulted in flooding in Iraq, prompting authorities to declare a state of emergency. Widespread power outages, overflowing sewers, and flooded streets displaced almost 84,000 people, according to news reports. 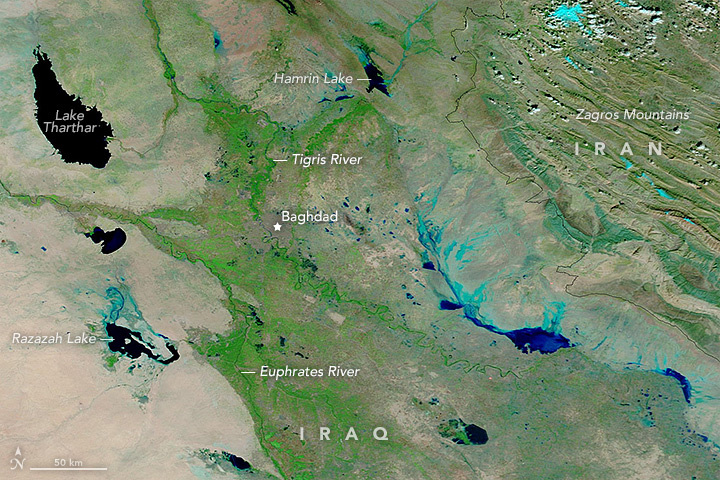 The image from the Moderate Imaging Spectroradiometer (MODIS) on NASA’s Terra satellite, featured on NASA’s Earth Observatory, shows the flooding. 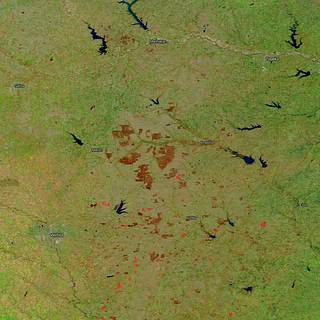 To see before and after images and read the whole article visit NASA’s Earth Observatory. The Moderate Imaging Spectroradiometer on NASA’s Terra satellite acquired this image of Canada and the western United States in mid-November, 2015. Snow and cold rain doused the region, bringing early winter weather and making researchers ask if this is the beginning of a wet El Niño winter. 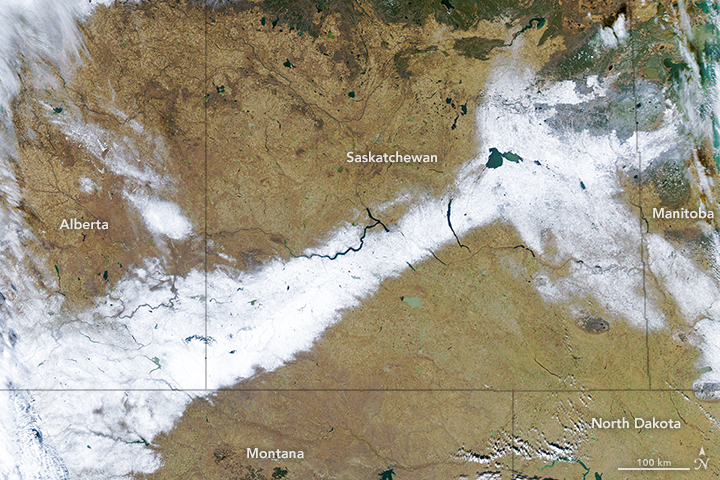 The image shows a band of snow stretching across southern Alberta and Saskatchewan. Read the whole article on NASA’s Earth Observatory. 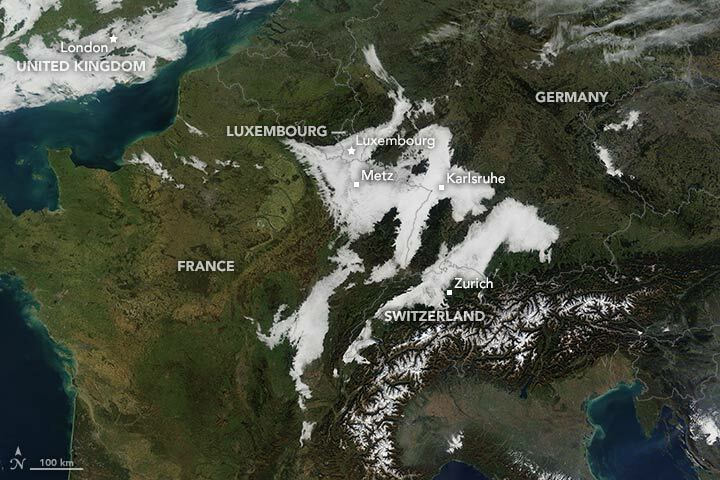 The Moderate Imaging Spectroradiometer (MODIS) on NASA’s Terra satellite acquired this image of dense fog in Europe. The fog appears brighter than typical clouds because the water droplets in the fog are smaller and more efficiently scatter light. The fog disrupted air travel in London and central Europe in early November 2015. The image was featured on NASA’s Earth Observatory Image of the Day. 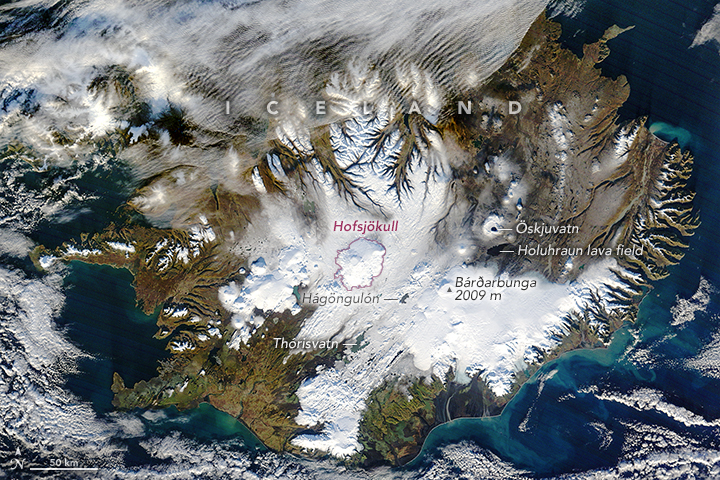 The Moderate Imaging Spectroradiometer on NASA’s Terra satellite captured a view of the Nordic island, Hofsjökull, on November 9, 2015. The island is experiencing its first gain in mass. Since 1995, the ice caps in Iceland have been retreating and losing volume, however in October 2015, ground based measurements showed that the Hofsjökull ice cap gained mass.